Rhinoplasty is surgery to reshape the nose. Nose can be enlarged or shrunk, nose can be changed with upper lip; The tip of the nose can be changed; Bulges and recesses or other defects in the sides can be corrected. Rhinoplasty, a surgical procedure that changes the shape or appearance of the nose while protecting or strengthening the nasal airway, is among the most commonly applied cosmetic procedures. In rhinoplasty purposes and techniques, there is variation depending on such factors as patient-doctor preference and facial features. 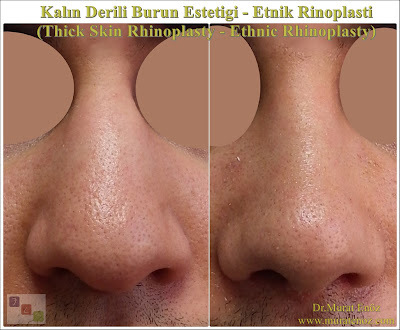 How is rhinoplasty surgery done? Rhinoplasty requires a 1-night stay in the hospital after surgery. Why are rhinoplasty surgery and what are the benefits? Rhinoplasty can change the size, shape and angle of your nose and make it better proportional to the rest of your face. Rhinoplasty can also correct structural problems that lead to chronic obstructive and breathing problems. After rhinoplasty, the splint and bandage around the nose is removed after about a week. The face, eye area and the area in your nose may show bruise and swelling for several days. This is less common in nasal aesthetic surgeries without breaking the bone. Cold applications can help to reduce pain and reduce swelling the most. Your doctor may also recommend pain relievers. Swelling and moras can last for about 10-14 days. During the first few days after surgery, you may need to lift your head and keep it relatively stable. It can take a few weeks to get back to the tiresome activities. How Early Is Rhinoplasty Surgery Possible? Cosmetic nose surgery should be done only on a fully developed nose. Complete improvement usually occurs at 15 or 16 years of age in females and 17 or 18 years of age in males. (In some sources this age may be 1 or 2 years later, generally not suitable for nose surgery before age 18). If the operation is performed before these ages, the results of the surgery may change and cause possible complications due to continued nasal development. Is Open Tech or Closed Tech more advantageous? Rhinoplasty operation can be done by open method and closed method. The open technique has an incision area on the columella which only divides the nostrils into two. External rhinoplasty called 'open approach' is better because it better describes the method used. The US is seen as the 'gold standard' for nasal aesthetics by most rhinoplasty surgeons (because the nasal structural components can be more controlled in this technique). For this reason, those advocating endonasal (closed) technique have turned to open technique for years (source: Rhinoplasty | Facial Plastic and Reconstructive Surgery | Stanford ...). The Results of Rhinoplasty Surgery Are permanent! The results of rhinoplasty are persistent, but subsequent injury or other factors may alter the appearance of the nose. After rhinoplasty, you can always expect temporary swelling and bruises around the eyes - nose. Nasal Esthetics Under Local Anesthesia If You Do not Have Surgery You Can Hear Bone And Cartilage Voices! If you choose local anesthesia, be ready for the voices of your doctor working on the bone and cartilage of your nose ... In patients with procedures related to the nasal bone, general anesthesia will be a much more comfortable application! The nose, one of the most prominent features of the face, can have a great influence on its image and appearance. If you are unhappy and long-suffering from your burns, it is a reasonable choice to consider rhinoplasty. As with other cosmetic procedures, you may be pleased with the results of rhinoplasty if you have clear, realistic expectations about what surgery can do and share with your doctor. Nasal Aesthetic Animation Programs Do not Always Reflect Final Outcome! During examination and interview with the patient before the nose aesthetics, digital imaging procedures are used to show the possible surgical outcome. The purpose of this procedure is to show the patient the possible end result of the surgeon and allow the patient to see these changes, to give an interest in the post-nasal appearance. - Patients with nasal skin and thick nose are advised to add a cartilage graft instead of cartilage weakening techniques and thicken the nose skin with two-level dissection in patients with thick nasal skin, which may cause abnormal tissue edema and round ball nasal appearance after surgery. - similar article link >> Burun Ucu Derisinin Kalınlığı, Burun Ucu Estetiği ve Burun Estetiği Sonrasında İyileşme Süresini, Ödem Miktarını ve Ortaya Çıkan Şekli Etkileyebiliyor! - rib and ear cartilage cartridges can be used for nasal aesthetic operation in patients with septic cartilage and nasal cartilage deficiency during pre-existing nasal surgery. In these patients, both the curvature of the ear drum and the rotation of the rib cartilages over time can cause an asymmetric nose to appear instead of a straight, symmetrical nose obtained in the animation program. Patients with the above characteristics should have the expectation that a more beautiful nose appearance will be obtained instead of perfection. Otherwise, serious frustrations may occur after the operation.